Wellington's description of his troops as - "the scum of the earth, they have all enlisted for drink" - is well-known. At the outbreak of the French wars in 1793, the regular army had been small, only about 50,000 men, mistrusted by a Parliament that insisted on passing an annual Army Act to keep it in being and kept its pay low. An ordinary soldier's fixed pay was a mere eight pence per day, and subject to "stoppages" and maintenance costs. In peacetime, recruits could be difficult to attract - "either grown up Vagabonds or young boys" according to the Adjutant General in 1787. During the Napoleonic Wars, the British army expanded significantly without conscription whereas Napoleon had to rely on conscript troops to fill his armies. It has been estimated that some 20-30,000 men were enlisted each year between 1805 and 1813, rising to an effective Army strength (including the militia) of 330,663 by 1813. 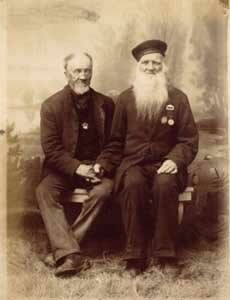 Taken in 1890, this photograph shows two survivors from the Battle of Waterloo, wearing the cap the Scot John Isaac Cameron, who had served with the 79th Highlanders, and the Frenchman, Paul Abraham, who had been with the 7th Regiment of French Infantry.